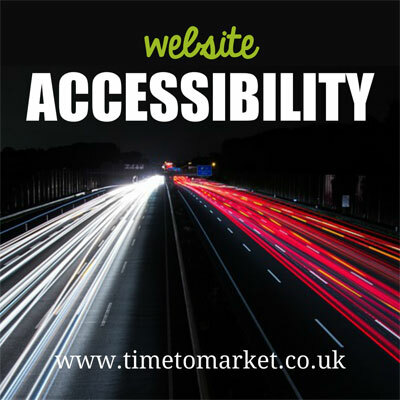 It is our aim to make website accessibility a key feature of the Time to Market website. And therefore make our features as available as possible to a wide audience. So we have used clean white backgrounds as a first priority. And where text springs from a background colour we aim for as much contrast as possible. We also try to use the right images to support the text. And we aim to use alt tags throughout the site. Occasionally we do make a glitch, but trust we fix it with haste. With many browsers you can change the size of the text by holding down the Ctrl key and moving the scroll wheel on your mouse. Or, if you are using Internet Explorer (IE7 and newer versions) go to Page and select Text Size. Or, try using the Ctrl key ++. Of course, pressing Ctrl — has the opposite effect. And if you are using Internet Explorer (IE6) or previous versions, go to View, Text Size and select Larger or Largest. Or if you are using Firefox, go to View, Text Size, Increase. Or, try using the Ctrl key ++. Again, pressing Ctrl — has the opposite effect. If you are using Netscape, go to View, Text Zoom and select the size you require. So simple. And if you are using Opera, go to View, select Zoom and then from the menu choose the size that you want to view. Then, you have the option to raise the percentage to increase the text size. Access Keys are not enabled on this website. Should standardization support greater utility for Access Keys we will implement them to improve website accessibility. To date we still don’t have that available on the web. You can always call +44 (0)1344 859823. Alternatively, you can contact us via a web form for presentation courses and coaching sessions.